We all know that children love snacks and with the impending return to school looming, it’s time to find those tasty lunchbox fillers. Now kids love those sugar and fat filled snacks, and a mention of healthy foods would have some turning their little noses up in disgust but as parents, we need to know that are children are eating healthy so that they grow big and strong. That’s where Walkers Mighty Lights come in, not usually perceived as a healthy choice, crisp often have a bad reputation but the chaps at Walkers have done their best to create a healthier alternative to the popular salty, fried snacks. 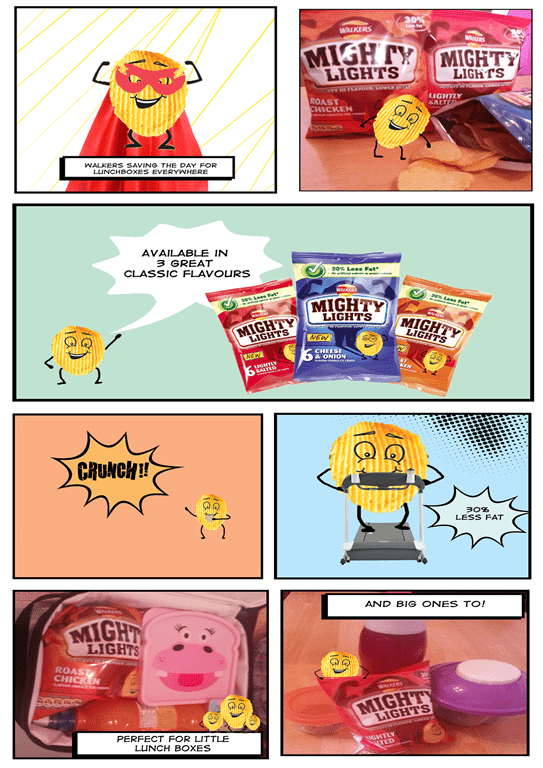 You see Walkers Mighty Lights are not your average crisp, sure they are tasty, crunchy and packed full of flavour but they contain 30% less fat than standard crisps. Now down to the nitty gritty, Mighty Lights are available in three flavours, Lightly Salted, Cheese and Onion and finally Roast Chicken; all of which are suitable for vegetarians. I’ve already mentioned that they are lower in fat than the average crisp, 30% less fat at that, a measly 0.5g of saturated fat per packet. Those are the kind of numbers that get my attention. Mighty Lights are made from real potatoes, with no artificial colours or preservatives. There are no nasties in these crisp plus they are a good source of fibre, as a parent these are the facts I like to here about food. Admittedly I am not so worried about the amount of fat my child is currently eating, she is energetic (in fact she never stops) but it’s great to know that these crisp are free from additives which are something I worry about in her diet. We were sent samples of the Mighty Lights to put to the test, I had two very keen taste testers on hand to give their verdict. Fist off we had the flavour test, there was no denying that these crisp packed in the flavour. I sampled all three flavours and was surprised that they were not lacking in flavour at all which is unusual for a healthier alternative. They didn’t have that healthy taste nor did they have that greasy texture that crisp tend to leave in your mouth. My personal favourite was the Roast Chicken, there certainly was no sacrifice in flavour there. The Mr was rather sceptical but having tried the Lightly Salted he was requesting them be added to his lunch each day from then on, they were the best low fat crisp he has tasted. 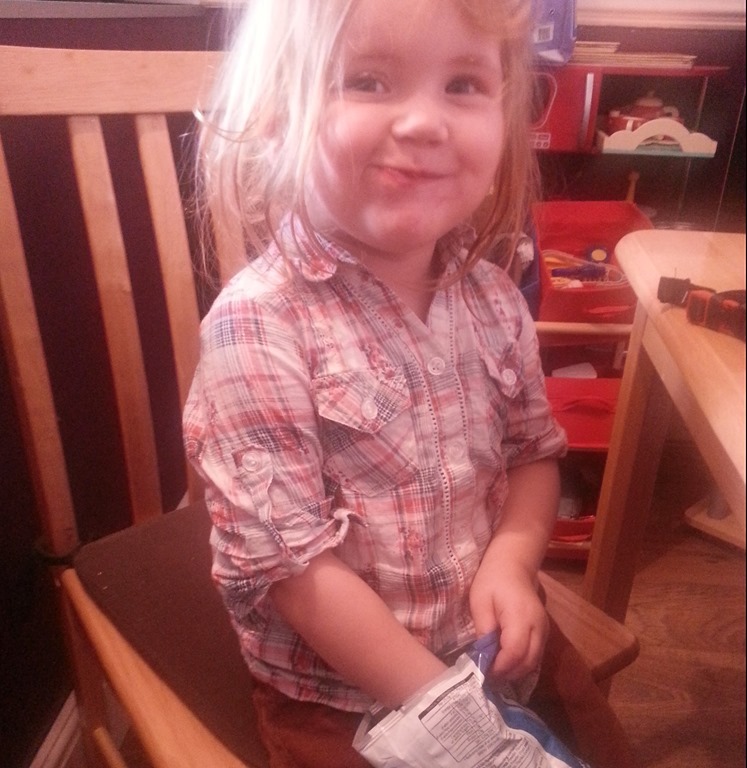 Isabelle had no complaints and the crisp served her well as a snack throughout the day, her favourite were the Cheese and Onion, mummy and daddy had to fight with her to at least sample one packet for themselves. Next on our check list was the texture, they had that crunch that you expect from Walkers, they were rigid but not overly hard and they were defiantly less greasy than standard crisp. Also Walkers haven’t scrimped on packet contents, the packets are filled with the same amount of contents as the equivalent crisp. Mighty Lights are currently on sale for as little as £1 for a pack of 6 across the nation now in various supermarkets. Each pack contains 6 packets so it works out at a decent value for money especially when preparing the lunchboxes for the week. My only one criticism would be there are aren’t enough flavours available yet, I would like to see more variety, perhaps even smoky bacon or prawn cocktail, they would be a welcomed addition to the range. Overall we would be happy to replace our usual crisp for Mighty Lights for our snacks in future, they’ve ticked all of our boxes and kept everyone happy at the same time. love the cartoon strip at the top. Well done on your win.